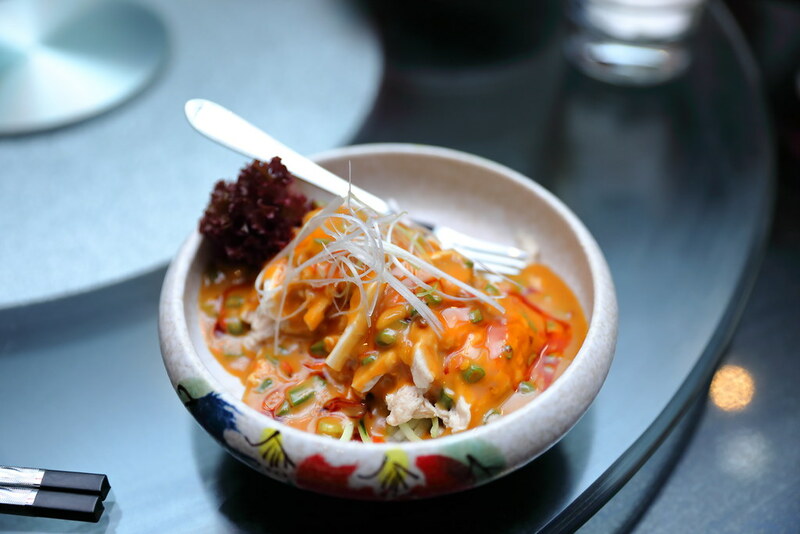 I mentioned earlier that the month of May has been an exciting month with many new restaurants opening in Singapore. 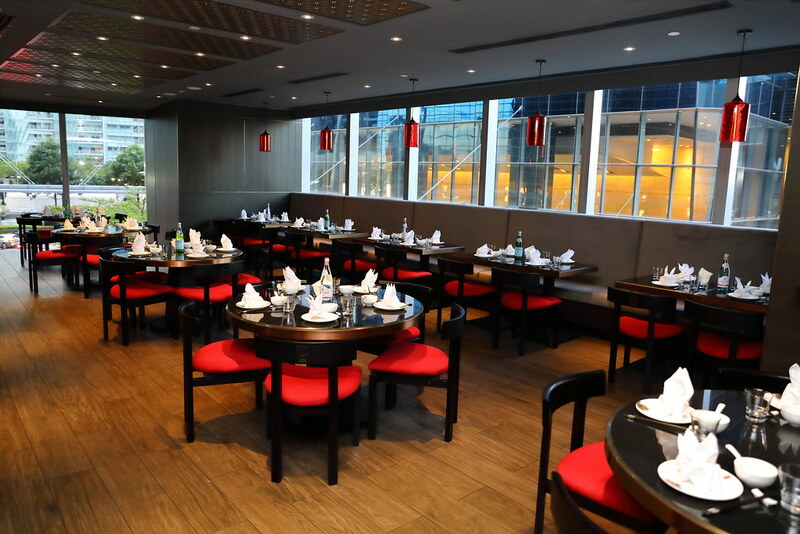 One of them is Qi - House of Sichuan at Marina Bay Financial Centre. For those not familiar with Qi, it is Hong Kong one Michelin starred restaurant for 2016 to 2018, winning the award for 3 consecutive years. One must be wondering why the name of the dish is called Bang Bang Chicken in Peanut Sauce ($13). It basically derived from the way the chicken is being tenderised with a stick or hammer striking the kitchen knife. Instead of the usual sesame sauce, Qi's version replaces it with a fragrant peanut sauce. It more like a cold appetiser with pulled chicken and shredded greens. I didn't really know how to appreciate the dish, as the combination tastes rather odd to me and I feel the chicken on the dry side. I love Chilli Oil Wontons ($12) and this is probably one of the best I have eaten. 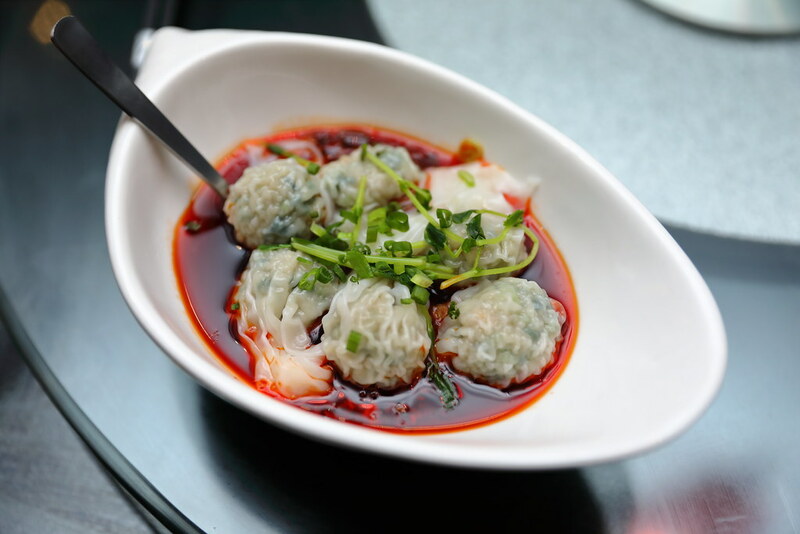 The golf ball sized wontons are wrapped in a thin and silky wonton skin, floating in a pool of intense and aroma sauce of roasted chilli oil, garlic and vinegar. On top of that, the meat stuffing of the wontons have that melted in the mouth texture, which comes across quite different from those I have eaten. For the sauce, I thought it was too garlicky, which didn't quite strike the right balance for me. I would prefer the vinegar level to be up a notch. 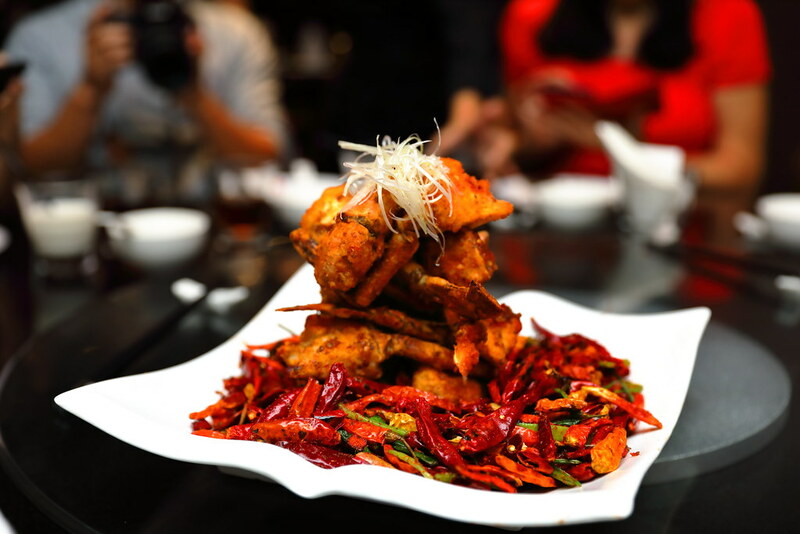 Sichuan cuisine is not just about spicy food. In fact it encompasses a wide spectrum of flavours such as sweet, aromatic, bitter, sour, peppery and salty. 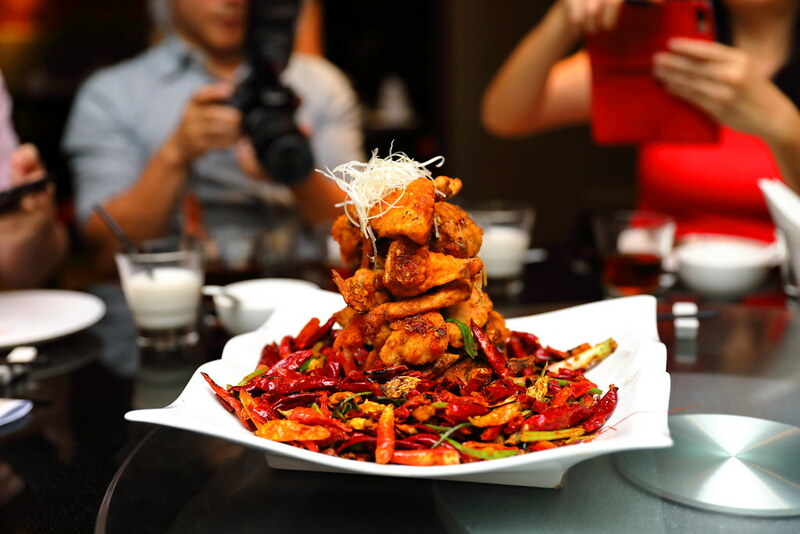 One such dishes on the menu that showcases the the sweet side of Sichuan cuisine is the Sugar Glazed Ginger and Scallion Beef ($25). 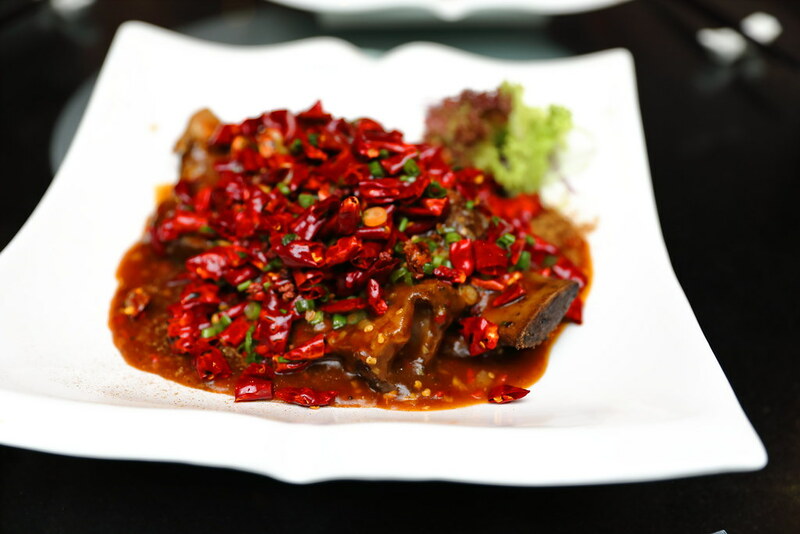 I am more familiar with poached sliced beef in hot chilli oil but a sweet beef dish is a first for me in Sichuan cuisine. Apparently this is one of Qi's best selling dishes, probably because it is not spicy at all? It is a safe dish I would order among on the spicy dishes. 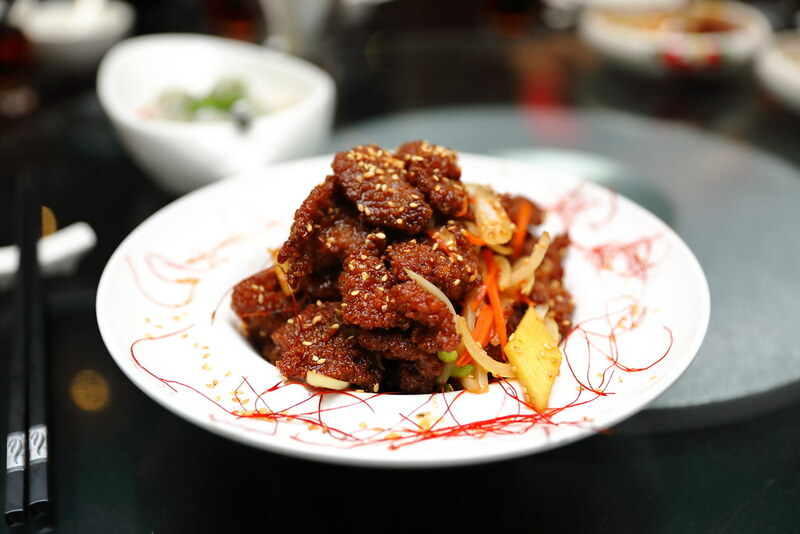 Saying that, the meat is indeed tender and juicy, kind of similar to the sweet and sour pork, with a crispy sugar glazed coat. Standing towering tall is the Chilli Fried Sri Lanka Crab ($115). Surprisingly I enjoyed this version of cooking the crab using 3-4 types of dried chilli and 6 different spices. Don't be scare by the amount of dried chillis on the plate, it is not as hot as you think. In fact, I thought it brings out the sweetness of the crab meat even more. Once again, don't be misled by the among of dry chillis on top of the Slow Cooked Beef Short Ribs with Mala ($75), It is not spicy at all. Just avoid biting into the Sichuan peppercorn. In fact it is really delicious and tender soft. This is achieved in marinating the black angus short ribs in black pepper and sea salt overnight. It is then stewed for 2-3 hours and grilled. I have to admit I was looking forward to the Crispy Diced Chongqing Style Chicken with Cashews ($38) but it left me disappointed. Usually I get excited when having this dish, the crispiness and spiciness from the diced chicken, will get my tastebuds dancing in delight but I didn't get the same experience here. The execution is decent but it probably lacks the 2 factor I was looking for. The bowl for the Braised Garoupa Fish Fillet in Chilli Oil Soup ($40/$50) is huge! It comes brimming with dried chilli peppers, garlic and basil. The sliced garoupa swimming in the pool of chilli oil is fresh, firm and bouncy. 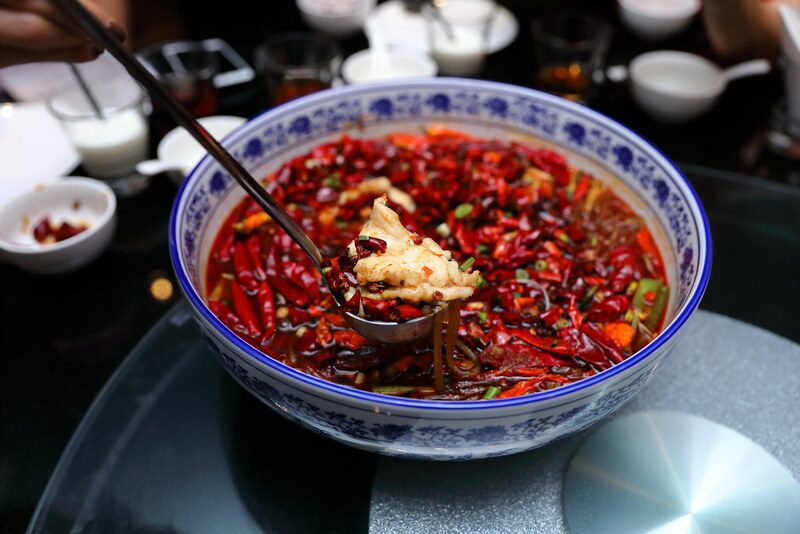 Unlike the traditional version, the chilli oil soup at Qi is less oily and drinkable. 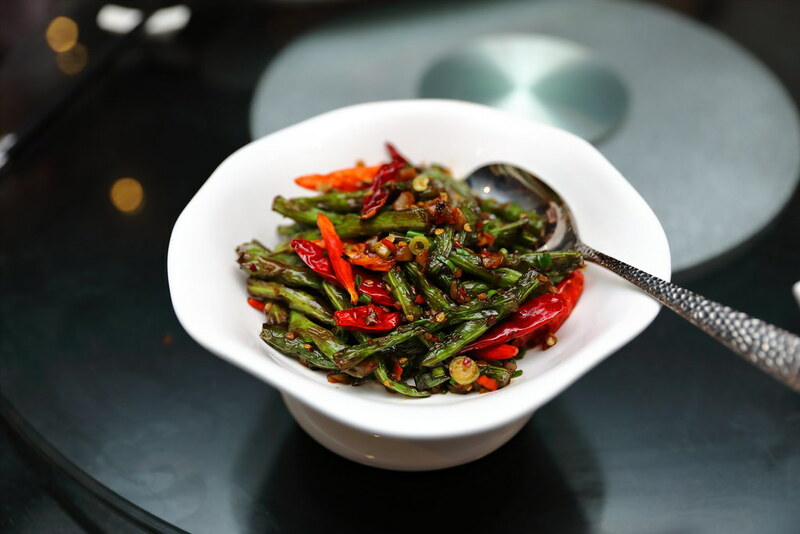 For some greens to make it a complete meal, you can go for the Vegetarian String Beans ($18). 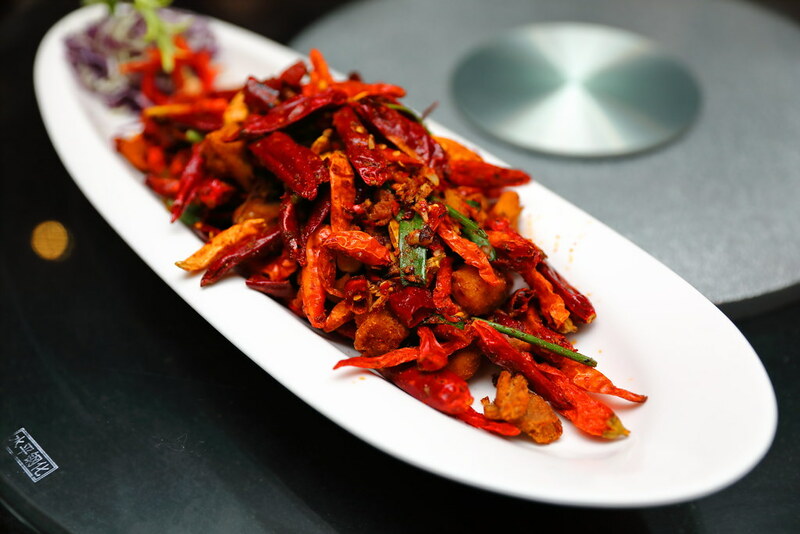 It is cooked to a delightful crunch with a hint of spiciness, it is also not very oily too. Wrapping up the meal, we have the Red Bean Pancake ($9). 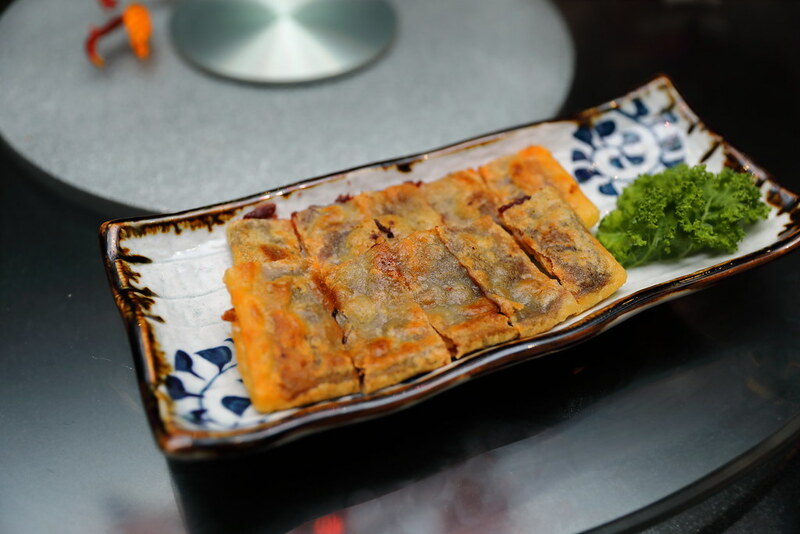 The paper thin crispy skin is stuffed with sweet red bean paste. A very pleasing dessert to end the dinner after all the spicy food. I am told that the interior and menu is the same as their restaurant in Hong Kong. What took me by surprise is the lunch set menus starting from $40 for 9 course (minimum 2 pax), I thought it is a steal.